Have your eggs poached instead of fried! 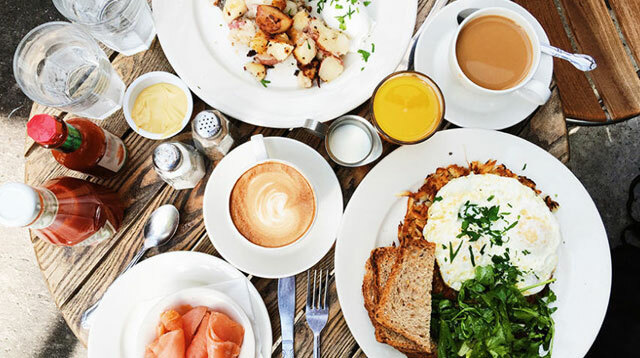 If brunch is your thing but you're trying to stay on the health wagon, it's not all bad news. By making some easy changes to your choices, you can do both. Yes, oats are packed with great stuff, but the other ingredients in granola (added sugars, syrups, and oils) are generally not. Ditching the box for a ladleful of creamy porridge allows you to control the level of sweetness of your cereal rather than already having it baked in—top with fresh fruit for instant five-a-day credentials. Or if you miss the crunch, add a sprinkle of mixed nuts for an added dose of vitamin E and healthy fats. Chicken sausages are far leaner than their usual counterparts, leading to better calorie and fat stats per piece. Try stuffing yours into wholemeal bread, or serving with eggs for a brunch that'll keep you going long after you've left the table. You can get everything from cashew to macadamia to almond butters these days, all of which contain a pretty impressive punch of protein and good fats for a relatively small spoonful. They're expensive, but a little goes a long way, so spread them thinly and a jar will see you through way more Sundays than you expect. And if you're going to have butter regardless? At least go for the grass fed kind, which is higher in omega-3 fatty acids, vitamins, and antioxidants than an average tub. Eggs are one of the cheapest, most versatile sources of protein and vitamins out there, but it's probably not a revelation to you that anything called "fried" isn't exactly diet-friendly. Unless you're really looking to crack down on calories, there's no need to drop the yolk, as that's where all the folate, vitamin B12, and omega-3 fats is hiding—poaching your eggs rather than frying them in additional butter or oil (at around 100 calories per tablespoon) still gives you all of the benefits, as well as that gloriously wobbly center for dunking. In the '90s, Jennifer Aniston famously confessed that she loved bagels, but she only allowed herself to eat the shell. Although we're totally for everything in moderation (including doughy bagel centres), she may have been on to something—bagels are fairly pretty much devoid of nutritional benefits, especially if you love the kind made from white flour. Going for wholegrain toast instead will give you fiber to help with digestion, and keep you full without spiking your blood sugar like your usual carb choice would. We get it—the labels read 'low fat', 'low calorie' and 'low sugar', and you instantly presume that your pot is the healthy one. The problem is that many store-bought yogurts are also packed with preservatives, hidden sweetener, and artificial flavors, rather than the produce itself (as the nice artisanal picture on the front would have you believe—naughty!) Trade shop-bought yogurt for plain or greek yogurt, tailored to your favorite flavors with fresh fruit—this new and improved bowl will provide great protein and a ton of vitamins, sans sneaky substitutes. Avocado isn't bad for you, it's just that you're probably eating far too much of it. A 'serving size' is technically just one-fifth of a medium-sized fruit, and when you bear in mind that each avocado contains around 250 calories before you've even thought about mashing it onto your toast and topping it with eggs, you can kinda see why. Keep to just a few slices and fill the avo-shaped hole in your heart with iron-rich, nutrient packed sautéed spinach—at just 18 calories per 80g, it's another fab way to get your greens. You know how your lips get greasy when you eat a hash brown? That's because these suckers are oily AF and generally coated in the kind of batter that will go straight to your hips. Make your own potato hash by dicing sweet potatoes and onions and lightly frying them in a little spray oil—you'll get fewer calories, lower levels of fat, and bonus vitamin A, all while still eating something that tastes amazing when covered in ketchup. Fruit juice is surprisingly high in sugar, and has no fibre to level it out—in fact, some nutritionists say it's almost as bad for you as downing a can of Coke, which you probs don't want to do before 10 a.m. Instead of getting your vitamin C from a glass of OJ, eat the whole orange, apple, grapefruit, or similar, and liven up water by infusing it with berries or slices of citrus. If you really must have juice, dilute it to give your stomach a chance to process the fructose. This one is fairly straightforward: calories in your average latte? 120. Calories in your average americano? 3. Milky lattes are fine as a once-in-a-while treat, especially because they look so darn good on your Insta feed. But if you're already loading your plates up with pastries, pancakes, or all that other awesomeness, switching to black coffee (or a splash of milk at around 20 calories) is a super easy way to lighten up without feeling like you're making too much of a sacrifice. We'll level with you: booze is never truly going to be a healthy choice. But if you're going for the kind of brunch that happens to be bottomless, it's handy to know that champagne is around 90 calories a glass, while prosecco is 69—and when you're drinking enough of either, that can be a pretty important difference.